HomePUSAPresidents Of The USA – Kudos To You! Album details!!! Presidents Of The USA – Kudos To You! – Track list! 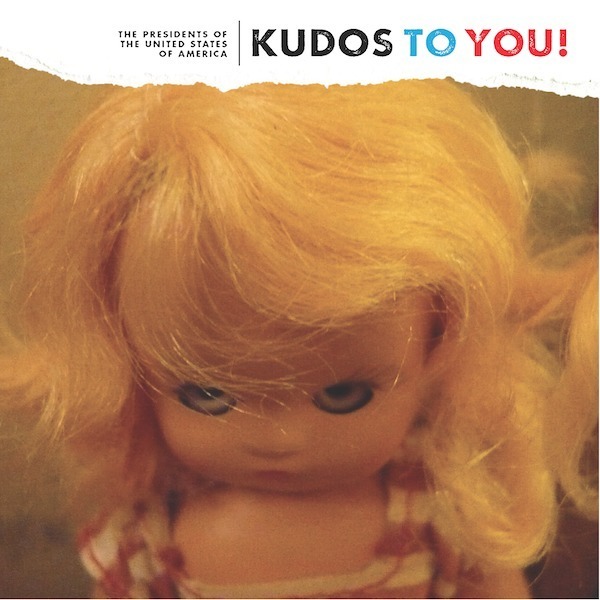 2014 brings Kudos To You!, the 7th full length studio album from Seattle’s The Presidents Of The United States Of America. Since 1994, PUSA has been spreading their skewed and joyous brand of pop to audiences the world over. PUSA has no idea where this album came from. As “full-time part-timers”, PUSA had thought themselves to be “post album”, enjoying a relaxed and limited touring schedule combined with liberal hammock time. When they booked two days with their longtime producer and FOH engineer MARTIN FEVEYEAR last October there were no expectations, and no material other than Singer Chris Ballew’s notebook. WHOOPS things got out of hand, and a month later Kudos To You! was tracked, necessitating changing their annual PUSAFEST shows in Portland and Seattle to record-release shows. Zing! Kudos To You! is a happy mix of old, new, and brand spanking new, that should hit right at the soft tissue of PUSA fans old and new. Ok, mostly old, but still it’s a fun listen and should eventually be purchased by everyone on the planet. Talk about the album – join the Presidents of the USA fan forum!